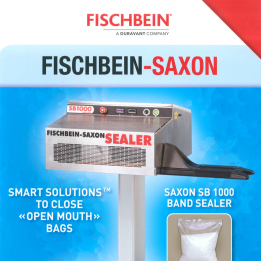 A pioneer in bag sealing technology, Fischbein introduced its first bag sealer over 30 years ago. Today, we offer a full-range of bag sealing solutions that include hot melt adhesive closures for paper bags and our line of Saxon® brand sealers for plastic bags and pouches. 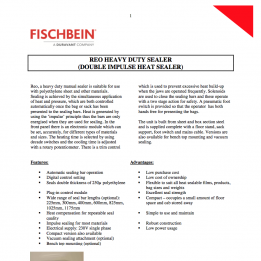 Based on their sealing performance, Fischbein and Saxon sealers are widely used in the food, medical, chemical, mineral, fertilizer and pet food sectors. 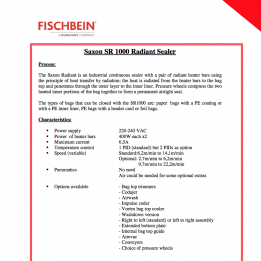 Fischbein and Saxon sealers are known for their durability, compact design and innovative features that include safe low voltage control panels, over temperature shut down sensors, variable speed drives, bag jam detection and high efficiency heaters that can reduce energy requirements up to 10 percent. 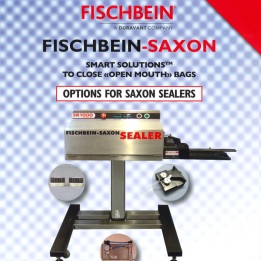 Fischbein and Saxon sealers are easily integrated into semi or fully automated bagging lines.